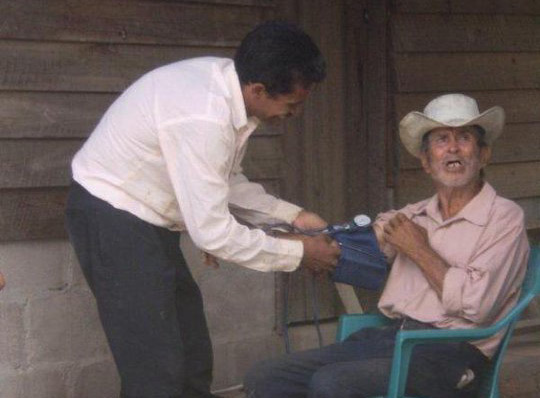 Since 2007, Honduras Good Works has teamed with the Episcopal Diocese of Ohio working with Doctors Bruce and Jane Ergood and the Episcopal Deanery of Yuscaran, Honduras to train local lay Hondurans in first aid. These workers, from rural villages without healthcare, are called Guardianes de Salud or Health Guardians. The Ergoods provide the initial education for volunteers in first aid and simple chronic care and we provide supplies and continuing education. On each medical brigade to the area, we take replacement blood pressure monitoring equipment, glucometers and glucose testing supplies, wound care supplies such as bandages and antibiotic creams, ace wraps, patient education and teaching supplies, and other supplies as requested. With all this support, the guardianes have been able to improve the health of their fellow villagers. Often they are better supplied than local public health clinics. At the end of each brigade, we leave all disposable supplies and medicines in Honduras. Supplies that are not appropriate for the guardianes and medications are left with the local public health clinic. We say that we arrive in Honduras with full suitcases and empty hearts, but that we leave with full hearts and empty suitcases (Fr. Paul Moore).